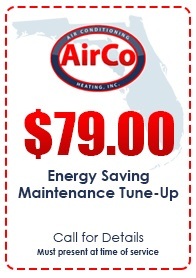 AirCo Air Conditioning & Heating offers all the benefits of affordable Jupiter air conditioning maintenance. If you have a fairly new air conditioning system, ongoing maintenance may be required to keep your warranty in effect. A maintenance contract with AirCo makes sense for you and for us, no matter the age of your HVAC system. Your maintenance cost is at a fixed rate that won’t change throughout the investment period. Benefits of a maintenance contract include 24-hour replacement of expired systems and hundreds of AC parts at no charge, as needed for repair and maintenance. You won’t be charged overtime, when work is needed during off hours. After three months, if your system doesn’t run more efficiently, you can take advantage of our no-hassle money back guarantee. Our highly trained technicians are qualified to perform in-depth twice-per year inspections of your AC, as part of your air conditioning maintenance contract. Whatever the brand or model of your air conditioner, our technicians have the training to perform preventative maintenance and repairs of the highest quality. With a stress-free maintenance contract, you can enjoy greater peace of mind, knowing that your AC will operate properly and safely, even when the equipment is most in demand. By efficiently keeping your home or business cool on summer days, you won’t have to face increased repair or operating costs. An incident-free cooling system is what every homeowner and business owner hopes for. When equipment breaks down on a steaming hot summer afternoon, it can be miserable and terribly inconvenient. In the height of a heat wave is when systems tend to break down, due to added strain caused by continuous operation. When you have our experts inspecting your AC system twice annually, the chances of a breakdown are greatly minimized. When an air conditioning system is well-maintained, your energy bills will be lower, since proper maintenance results in a greater efficiency. A good way to think about it is to compare it to oil changes in a car. Most vehicles will run smoothly by simply keeping up with oil changes. An automobile tune-up will ensure that you have better gas mileage, as well. Cooling systems have similar results from routine air conditioning maintenance. 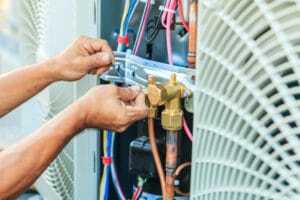 Not only does your air conditioner operate more efficiently with maintenance, you can also expect that the equipment will have a longer lifespan. One malfunctioning part can cause a breakdown of the entire system. 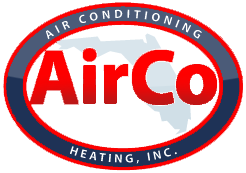 AirCo is the most trusted company for Jupiter air conditioning maintenance. Contact us today to schedule ongoing upkeep that will save you money in the long run.